IDrive Personal will archive files from as many computers as you have. As with Acronis and Moby, you’ll need to pay for the online storage space, but IDrive is the least expensive backup service of the four services reviewed here, and if you have a lot of data, it can be a bargain. 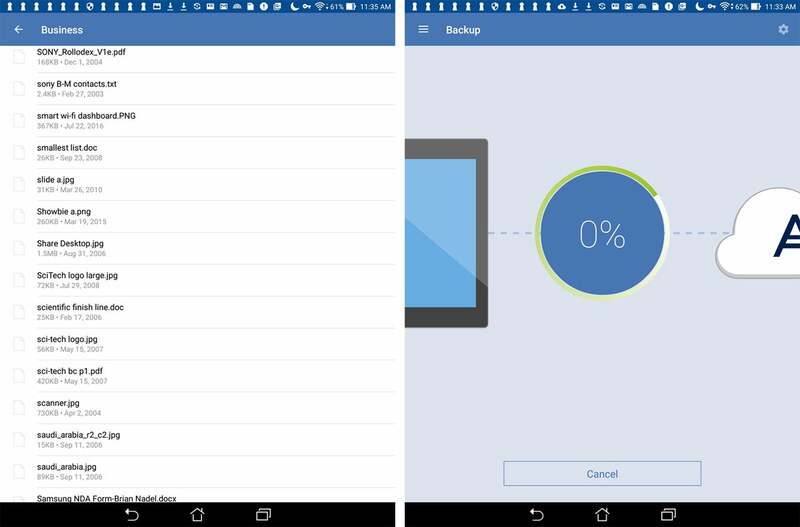 There’s a free Basic service that offers 5GB of storage space for those with limited backup needs. In my tests, I set up the lower tier for the IDrive Personal 1TB plan, which at the time cost $70; since then, however, this plan has doubled in size to 2TB while falling in price to $52 for a year. That is just over half what Acronis charges, for twice as much storage. There’s also a 5TB tier of IDrive Personal that’s $75 per year. If your data provider meters your online use, IDrive can ease that first big backup with IDrive Express. The company sends you a USB hard drive onto which you transfer up to 3TB of files, then ship back to IDrive. 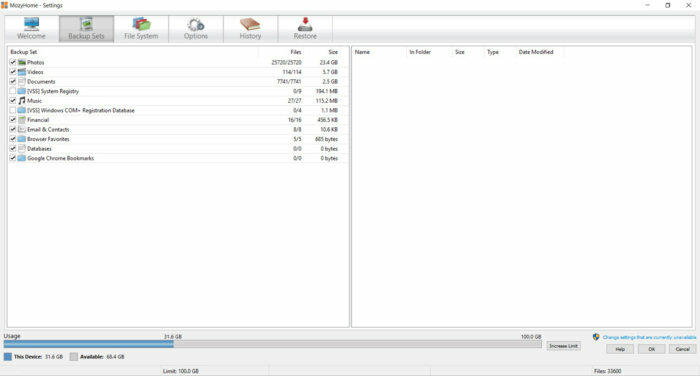 Within a day of when IDrive receives the drive, the files are typically online and ready. It’s free (including shipping) to use once a year. The service’s 20.2MB Windows app can be downloaded and installed in three minutes. IDrive’s busy interface has links on the left for Backup, Restore, Scheduler, Sync and Settings. There’s also a page that lets you back up Exchange, SharePoint and other servers. IDrive’s interface is a little busy, with redundant navigational cues that some may find annoying and others may find handy to get to various features. The service can be set to back up every file. 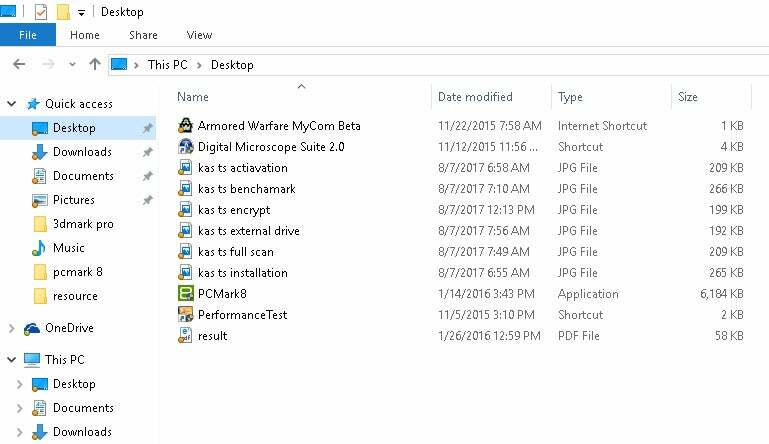 They’re all encrypted using the 256-bit AES cypher, but the service lacks Acronis’ blockchain technology to verify a backup file’s authenticity. You can keep your own encryption key. 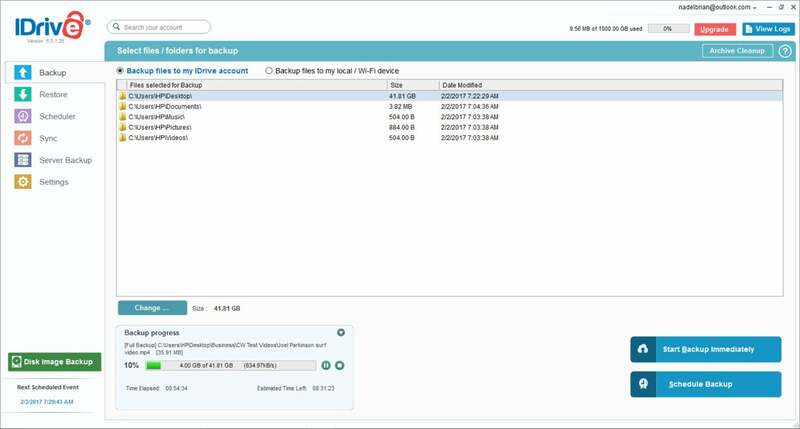 Dig deeply and you can set up continuous backups as well as image the entire machine onto an external drive. The app lets you throttle your upload speeds as well as schedule your daily backups. IDrive has a powerful scheduling function that lets you set up backups for the middle of the night. It not only lets you establish a cutoff time for long backups, but (optionally) sends you an email notification when it’s done. Setting up a backup schedule in IDrive is easy. In addition to online storage of backups, IDrive lets you mirror the system’s image on an external hard drive as well as back up Facebook items. You can add folders to the backup and exclude file types. There are apps for Windows PCs, Macs and Linux computers, as well as mobile apps for iOS and Android devices. Those on the go can view any file via a web browser. As the files flow from the system to the server, IDrive shows a progress bar and an estimate of how much time remains. IDrive’s initial 41.8GB backup was accomplished in 7 hours, 46 minutes and 41 seconds, for a disappointing throughput of 1.49MBps — less than one-half as fast as Acronis, but faster than Mozy. Its 42.4-second incremental update was right in the middle of the services tested. The service restored an image file to my Windows PC in 11.3 seconds and retrieved the file from the cloud to my Android tablet in 12.7 seconds, in the middle of the pack for both. Got a lot of computers to protect? IDrive can back up all of them fairly efficiently and keep all the data online. And at 2TB of cloud storage for $52 or 5TB for $75, it offers the best bang for the buck in this roundup. Mozy’s MozyHome service uses parent company Dell’s EMC data infrastructure to securely hold your documents, images, documents, music, videos and other key files. It ignores things such as .aci, pagefile.sys and even some Mozy program files. There’s a free service that provides 2GB of storage space, and you will be awarded with 256MB of extra storage for every acquaintance you refer to Mozy. I used the $120 annual plan that includes 125GB of space and can back up three computers. By contrast, IDrive offers 16 times as much space for about $70 less. Mozy matches Carbonite by promising to send you all your files on a hard drive if for some reason you can’t retrieve them from the cloud, but Mozy charges $30 for processing, $40 for shipping and 50 cents per gigabyte. For instance, if you have 100GB saved online, it would cost $120, making it quite expensive compared to Carbonite Prime’s similar service. The Home service doesn’t let you jump-start the backup process by shipping your files on a drive to Mozy, but Mozy’s Pro service does. You can back up data locally on an external hard drive. In addition to software for Windows PCs, Macs and iOS and Android devices, you can also get any saved file with a web browser. The 12.5MB MozyHome Windows app took 1 minute and 15 seconds to load and get started, easily the fastest of the group. When you set up the program, the company offers the choice between using a 448-bit Blowfish cypher, with Mozy managing the key, or 256-bit AES encryption, with you choosing the key. 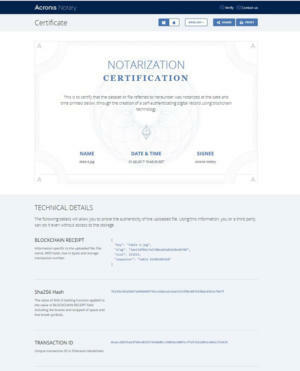 It lacks Acronis’ ability, though, to add blockchain technology to prove that your archives haven’t been changed. 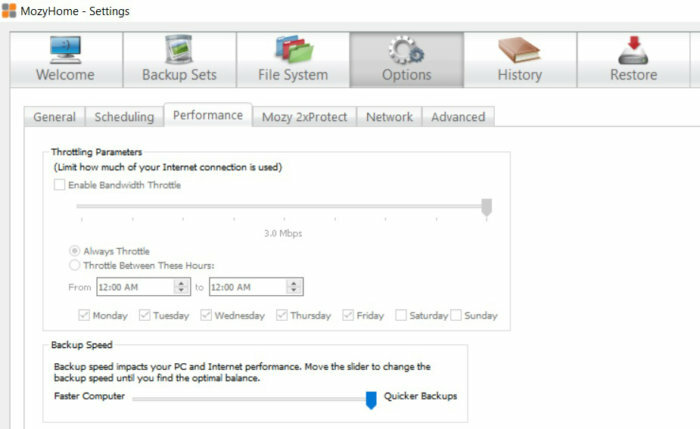 Mozy’s backup interface has two windows, which can be a bit confusing. The interface is a bit tricky to figure out, with two windows to deal with. I often found myself looking at the wrong one. The Settings page can run full size and shows Backup, File System, Options, History and Restore; it has a Welcome screen that explains the app. Mozy also has a smaller Status screen that shows what needs to be backed up and what has been sent. It lacks a progress bar or estimate of time remaining, but the program’s task tray icon slowly turns green from left-to-right to show progress. 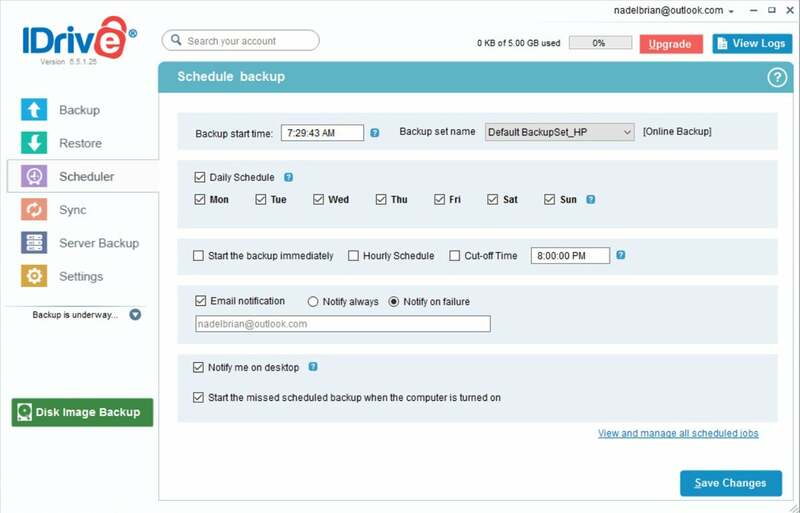 There’s a lot to customize with the Settings screen, including scheduling backups. You can throttle the bandwidth used and adjust between having a faster computer or quicker downloads. You can decide how much of your internet connection Mozy can use with the Throttling Parameters setting. Mozy was the slowest of all the services tested, with an initial backup of 31.6GB taking an excruciating 13 hours, 44 minutes and 25 seconds, for an average 606KBps transfer rate. It’s best to set it up for an overnight upload. The service’s 64.2-second incremental backup was also the slowest of the five and more than double that of Carbonite’s service. Its file recovery efforts were more satisfying, retrieving the test image file in 8.2 seconds on the Windows PC. While the service was able to show a thumbnail of the target online file in 2 seconds on my Android tablet, it took a total of 13.9 seconds to download the entire 130KB file. 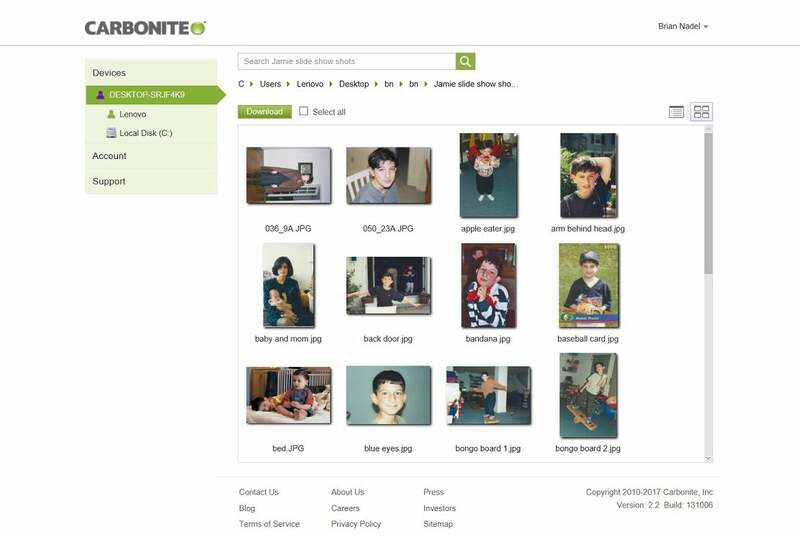 In addition to using an awkward two-fisted interface, MozyHome was the slowest of the four at backing up and restoring files — and at $120 per year for a meager 125GB of online storage, it’s the worst deal of the roundup. 41.2 sec. 30.8 sec. 42.4 sec. 64.2 sec. 8.1 sec. 13.3 sec. 11.3 sec. 8.2 sec. 5.1 sec. 18.6 sec. 12.7 sec. 13.9 sec. Success in backing up your vital data comes down to the three S’s: speed, security and software. All four of the backup services I looked at fulfill the minimum here, although all but one fall short in one area or another. For instance, Mozy lets you pick your encryption method, but its double-barreled approach to software is hard to understand, and its annual cost per storage offers poor value. Plus, if time is of the essence, steer clear of Mozy, because it’s the slowest of the four by a wide margin. Even though its backup was six hours shorter, IDrive still took too long to do its initial backup. At least the company recognizes that shortcoming and lets you send it a hard drive of your files for a less frustrating start. On the plus side, its interface allows lots of customization, and IDrive offers 2TB of storage space for $52 — the best deal here. Carbonite offers unlimited space to put your files, but limits what file types you can store. While the service offers to send you a hard drive with all your files to ease a recovery, it gets rid of your files after an all-too-short 30 days. 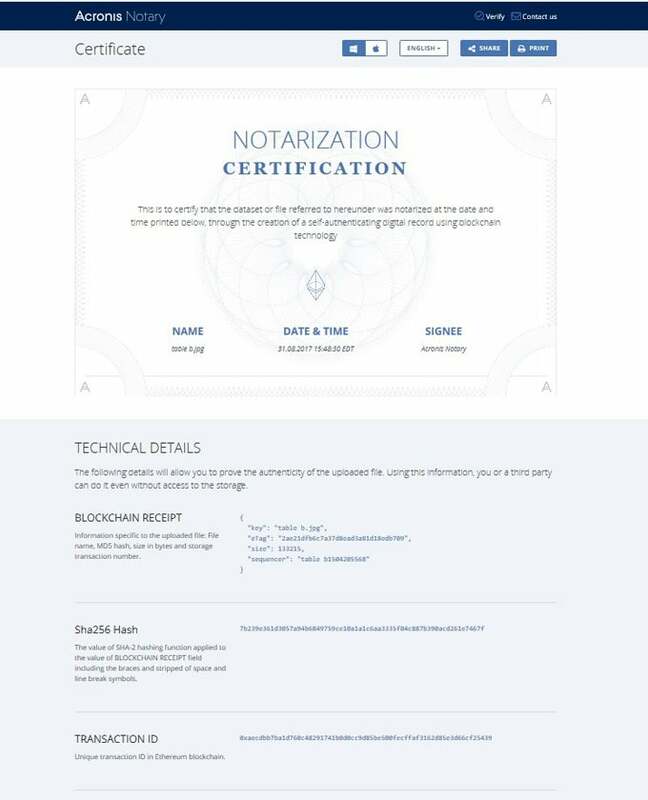 Acronis is alone in this group in offering file verification using blockchain technology. Acronis’s True Image 2018 had a clean sweep in terms of speed, with the fastest backups, and software, with an easy-to-learn interface that provides a good overview and access to the details without being overwhelming. It also stands alone in terms of security, with top-rank encryption, a way to protect against ransomware, and blockchain technology to show that a backup hasn’t been altered. In other words, you know that the backup is not only yours, but it hasn’t been compromised. 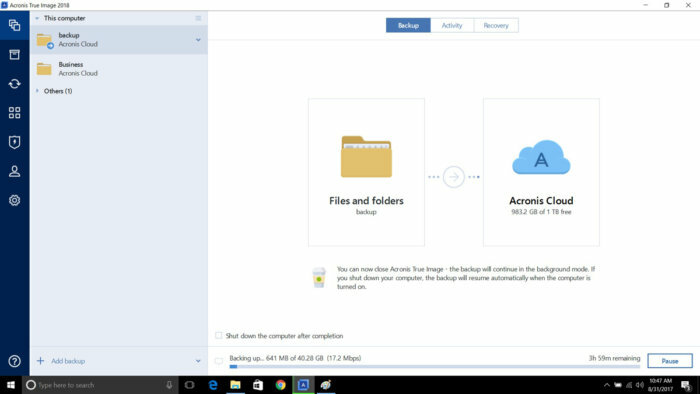 It’s a big deal, and as soon as the subscription with my current online backup service expires, I plan to switch to Acronis True Image. To measure how these online backup services rate and compare, I downloaded each app onto a Wi-Fi-connected HP EliteBook Folio G1 laptop running Windows 10 Pro and set up an account for each service. After nosing around to get the feel of the program, I started the heavy work of backing up its array of files, which includes a folder on the desktop that contains 40GB of work data composed of 40,700 files, ranging from documents and images to accounting records, presentations and videos. Before running the backup, I tested my online connection using Speedtest.net’s online benchmark. I then timed how long it took to perform the initial backup using the service’s default settings. I finished by once again testing the available bandwidth. Next up, I added 11 files totaling 86MB as the typical product of a workday’s toil and timed how long it took to back up this incremental data. The files included videos, PDFs, spreadsheets, images and presentations. I then simulated a file loss by deleting a 130KB image file and timed how long it took the program to restore it. Finally, I grabbed the same image file from the online archive and timed how long it took to display it on an Android-based Asus ZenPad 8 and an Apple MacBook Air notebook. The Mac performance was in line with the Android results, so for the sake of simplicity I reported only the Android results. After the digital dust had settled, I wiped the backup software from the system and started on the next one.